The divine elder Abraham O Nikephoros. 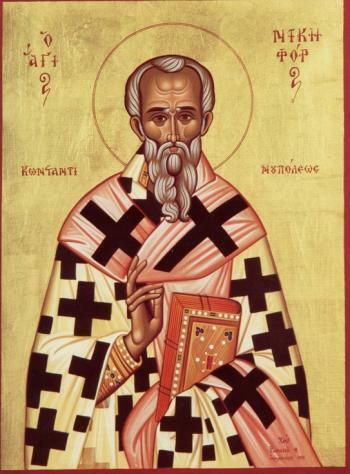 This Saint was born during the reign of the iconoclast emperor Constantine V Copronymos (741-775) in the year 758. He was well educated. His father, Theodore, was secretary to the emperor Constantine. Theodore, however, was an iconodule and came into conflict with the emperor who removed him from his position and then had him scourged and tortured before banishing him. 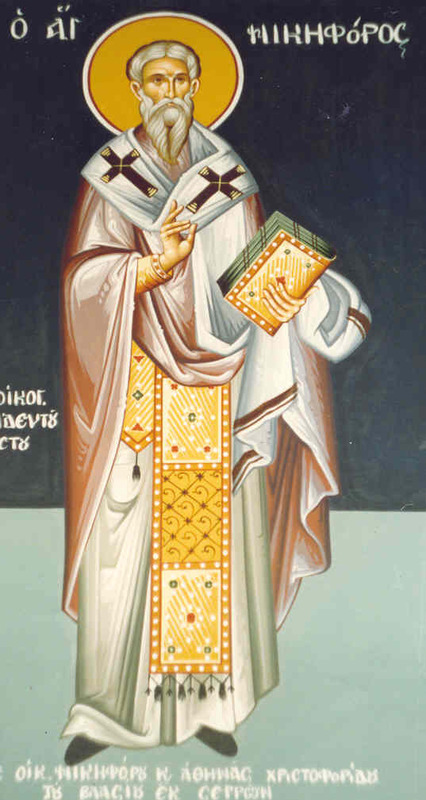 Thus, Nikephoros grew up with his father's example of defending the veneration of the icons before his eyes. 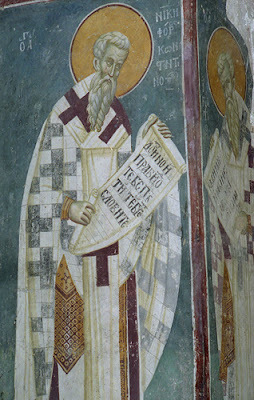 When Constantine VI (780-797) and Irene came to the imperial throne and restored the use of sacred images in churches, Nikephoros came to their notice and soon obtained their favor and was placed in his father's former position. He distinguished himself greatly by his zeal against the Iconoclasts. He also served as secretary at the Seventh Ecumenical Synod in 787. 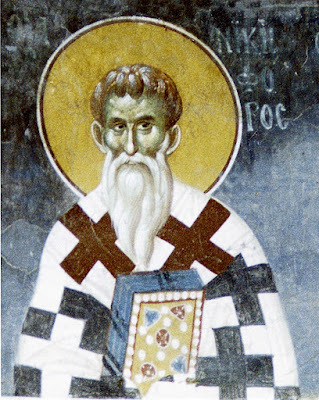 After he withdrew to one of the monasteries that he had founded on the eastern shore of the Bosporus, until he was appointed director of the largest home for the destitute in Constantinople in c. 802. 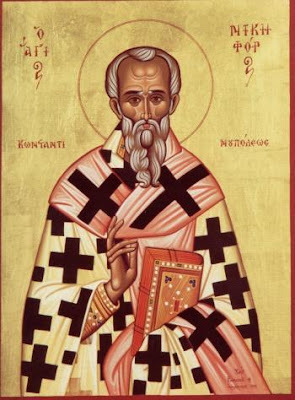 After the death of Patriarch Tarasios of Constantinople on February 25, 806, no one was found more worthy to succeed him than Nikephoros, although he was still a layman (Easter, April 12, 806). To give an authentic testimony of his faith, during the time of his consecration he held in his hand a treatise he had written in defense of holy images, and after the ceremony was concluded, he laid it in back of the altar as a pledge that he would always maintain the tradition of the Church. The uncanonical choice of Nikephoros by the emperor met with opposition from the strict Stoudites led by Theodore the Studite, and this opposition intensified into an open schism when Nikephoros, in other respects very rigid, showed himself compliant to the will of the emperor by reinstating the excommunicated priest Joseph. Over the following years, Emperor Constantine VI was blinded, Irene was banished, Emperor Nikephoros I, her successor, had fallen before the Bulgarians, Emperor Michael I was driven from the throne, and, in 813, Leo the Armenian became emperor. He was an iconoclast. 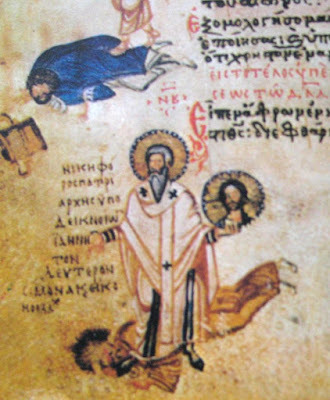 Leo began a campaign to suppress the veneration of the icons and to persuade Patriarch Nikephoros to approve their removal. However, the patriarch did not bend. Foreseeing the storm gathering, Patriarch Nikephoros and several bishops and abbots spent most of their time in prayer. Soon after, Emperor Leo with certain iconoclastic bishops, sent for Patriarch Nikephoros and his fellow-bishops. They obeyed the summons to the palace, but entreated the emperor to leave the government of the Church to her pastors. Saint Nikephoros said to Leo the Armenian the iconoclastic emperor: "The icon is a divine thing and not to be worshiped." Following this, he explained "how God commanded Moses to make a serpent of brass and to raise it in the wilderness even though, just before this, He had commanded: 'Thou shall not make unto thee any graven image' (Ex. 20:4). He commanded this in order to save the chosen people from the idolatry of the Egyptians and He commanded that He, the One and Most High God, would manifest His power through a visible thing." In a rage Leo drove them from his presence. Later, the iconoclast bishops assembled in the imperial palace and directed Patriarch Nikephoros to appear before them, to which he responded, "Who gave you this authority?" Further he said he would listen only to one of the other patriarchs. The iconoclastic bishops proceeded to pronounce against him a sentence of deposition and the holy pastor, after several attempts had been made secretly to take his life, was sent by the emperor into banishment. Michael the Stammerer, who succeeded Leo the Armenian in 820, also favored the iconoclastic faction, and continued to harass Saint Nikephoros, who died in exile on June 2, 828, in the Monastery of Saint Theodore. By order of the empress Theodora, his body was brought to Constantinople by Patriarch Methodios with great pomp, on March 13, 846, and interred in the Church of the Holy Apostles, where they were annually the object of imperial devotion. His principal works are three writings against iconoclasm and thirty-seven holy canons. He is celebrated by the Church on June 2nd and March 13th. Thine inspired confession gained victory for the Church, O holy Hierarch Nikephoros. Thou didst suffer unjust exile through reverence for the icon of God the Word. O Venerable Father, pray to Christ our God to grant us His great mercy. Thou didst receive from God the victor's crown: save those who faithfully venerate thee, as a hierarch and teacher of Christ.